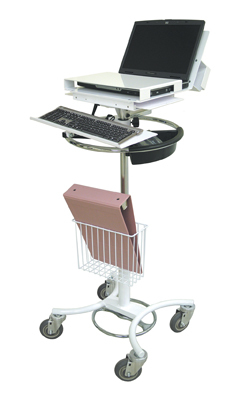 Chart Pro's industry-leading line of portable computer and laptop stands are the perfect solution for your EMR charting needs. Our stands come with a multitude of accessories to provide added convenience to your mobile computing. SKU # LTC-0707, The ultimate in portable EMR charting! SKU # CTS-0714, includes 10' cord reel & three (3) power oulets! SKU # LTS-0306, Locking work surface keeps laptop & data secure.